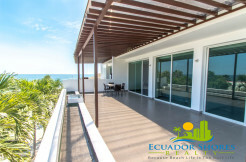 If you are looking for one of the best deals for the money and direct beachfront location, this is it!! 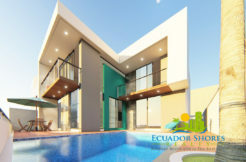 This condo is located in the beautiful area of Santa Marianita Ecuador. 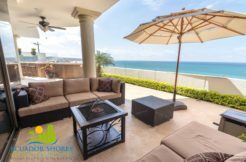 The condo sits just to the South of the main strip allowing you plenty of peace and quiet while still being with walking distance of great places to eat and relax with friends. The condo runs the length of the building with the bedrooms toward the rear. The living area opens up to the kitchen leaving you with plenty of room and space. 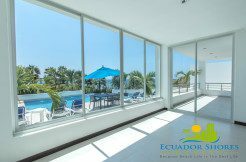 The sliding glass doors open to the beautiful Pacific Ocean and you will always have an unobstructed view of the blue water. During the whale season you can watch the whales migrate just offshore from the comfort of your balcony chair. Sunsets are a nightly relaxation appointment and you have a front row seat! Priced fully furnished at only $99,000 this is a great opportunity for the Santa Marianita lifestyle. Call us today for more information!